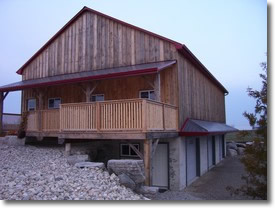 Circle Rock Inc. is located in the heart of mid-western Ontario, Canada. This area has rich, fertile farm land, with a hand hewn timber frame structure on virtually every one hundred acre parcel of land. These barns are magnificently crafted structures that have stood the test of time. Unfortunately, many of these barns are no longer suited to today's agricultural practices. This has created the opportunity for home and cottage owners to incorporate the antique lumber into their building projects. Circle Rock Inc. carefully dismantles these timber frame structures and sells the reclaimed lumber into several different markets. Each barn is unique in terms of the species of antique timber used. Circle Rock Inc. will blueprint and tag the reclaimed timber frames that are especially well preserved. These hand hewn timber frame structures can be re-assembled anywhere for future generations to enjoy.